An artist recreates those aspects of reality which represent his fundamental view of man and of existence. In forming a view of man’s nature, a fundamental question one must answer is whether man possesses the faculty of volition—because one’s conclusions and evaluations in regard to all the characteristics, requirements and actions of man depend on the answer. Their opposite answers to this question constitute the respective basic premises of two broad categories of art: Romanticism, which recognizes the existence of man’s volition—and Naturalism, which denies it. Rand's belief that one can infer the artists "fundamental view of man and of existence" reaches its most elaborate development in her Romanticism/Naturalism dichotomy. Like so many of her aesthetic concepts, it is, at best, based on a few half (or even quarter) truths, which are exaggerated way out of proportion. Some of Rand's favorite authors (i.e., those whom she regarded as Romanticists) explicitly believed in free will (e.g., Schiller, Hugo, Dostoevsky), while some of the authors Rand deplored (i.e., those whom she regarded as Naturalists) either believed in determinism or were skeptical about free will (e.g., Tolstoy, Zola, Dreiser). What impact any of this has on the actual literary productions of these authors is somewhat debatable. While there may be a few exceptions (Zola comes to mind), you really have to engage in a great deal of over-interpretation to read determinism or free will into the novels of most serious authors. Generally speaking, most great literature attempts to portray human beings realistically, which means: under the influence of various passions, desires, and sentiments. Some characters may appear to have more self-initiative and therefore could be considered as exemplars of "free will"; others characters may be more passive or impulsive, and therefore could be considered exemplars of "determinism." However, there is nothing mandatory or even insightful in such interpretations. The fact that an author portrays a passive character does not necessarily give us any insight into his "fundamental view" of man. In real life, one finds both active and passive individuals. If one wishes to present a wide variety of human character (and this is what many serious authors wish to achieve), one needs to portray both types. If man possesses volition, then the crucial aspect of his life is his choice of values—if he chooses values, then he must act to gain and/or keep them—if so, then he must set his goals and engage in purposeful action to achieve them. The literary form expressing the essence of such action is the plot. Such a sequence cannot be constructed unless the main characters of the novel are engaged in the pursuit of some purpose—unless they are motivated by some goals that direct their actions. In real life, only a process of final causation—i.e., the process of choosing a goal, then taking the steps to achieve it—can give logical continuity, coherence and meaning to a man’s actions. Only men striving to achieve a purpose can move through a meaningful series of events. Contrary to the prevalent literary doctrines of today, it is realism that demands a plot structure in a novel. All human actions are goal-directed, consciously or subconsciously; purposelessness is contrary to man’s nature: it is a state of neurosis. Therefore, if one is to present man as he is—as he is metaphysically, by his nature, in reality—one has to present him in goal-directed action. Is it really true, as Rand contends, that the use of plot determines whether an author believes in volition? No, it is not true. Rand's argument doesn't even make sense on its own terms, let alone anyone else's. She describes a plot as "a logical structure of events, a sequence in which every major event is connected with, determined by and proceeds from the preceding events of the story." The language Rand uses to describe a plot quite literally drips with determinism. After all, how can a logical sequence of events in which every event is "connected" and "determined" by previous events entail free will? Yes, I know, Rand insists that the events are driven by the goal-directed behavior of the story's characters. But even with this condition, Rand's concept of plot still smacks of determinism, suggesting the sort of characters who never waver from their goals, as if once a choice is made, one cannot change one's mind and adopt a different route. If free will involves, not merely the choosing a goal, but enjoying the ability to change one's goals in midstream, then her theory about plots be linked to volition breaks down. Indeed, when looked at more critically, there is no necessary connection between plots and volition: it's all a rationalization on Rand's part to justify her preference for narratives with suspenseful stories. Just as a plotless narrative may be entirely consistent with free will (since the logical sequence of events can be broken by characters changing their minds), so a narrative with a strict plot may be entirely consistent with determinism. Coleridge regarded Oedipus Rex as one of "the three most perfect plots ever planned." And indeed, there is in Oedipus a perfect logical sequence of events in which every major event is connected, determined, and proceeds from the preceding events in the story. Yet Oedipus positively drips with determinism. Other examples plots being used to enhance sense of deterministic fatalism are Shakespeare's MacBeth and Thomas Hardy's Tess of the d'Ubervilles. However (and this a very important point) even though Sophocles, Shakespeare, and Hardy wrote "fatalistic" narratives, this is hardly proof positive that they were determinists. Perhaps they were, perhaps not. Their choice of subject matter is not decisive in this respect. Sophocles and Shakespeare simply dramatized whatever stories happened to be commonly available. There is no reason to assume that the decision to dramatize a "fatalistic" narrative indicates either a conscious or subconscious commitment to determinism. Shakespeare also dramatized non-fatalistic plays (like most of the comedies). 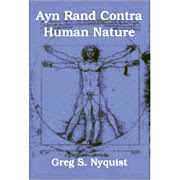 A few of his plays imply a stronger commitment to free will than one finds even in Rand's Atlas Shrugged. After all, in Atlas, all the villians stick to their villianous guns, as if they are all villians by necessity, rather than by choice. (I realize that Rand did not intend that her villians should be regarded as determined, but if we apply her own selectivity principle to them, what is to prevent us, logically speaking, from hoisting her on her own philosophical petard?) In Shakespeare, one finds villians changing their ways and becoming virtuous, all suggesting belief in free will. Henry IV, Measure for Measure, and The Winter's Tale are examples of this process in action. So does that prove that Shakespeare believed in volition? No, not necessarily. What it proves is that one cannot establish an author's philosophy from his choice of subject matter. There may be any number of reasons an author chooses a particular subject matter, some of which may have nothing to do with the author's core beliefs. Many authors are primarily attempting to earn a living. At bottom, Shakespeare was a businessman seeking to please to play-going public. Unlike Rand, he was not using literature to propound his own personal philosophy. Indeed, to this day, we don't have any great familiarity with Shakespeare's personal beliefs. Which of his plays comes closest to portraying his "fundamental views of man and existence" are a complete mystery (and, in the final analysis, unimportant). Each of Shakespeare's plays is a world unto itself, and many of them seem to portary vastly different "fundamental views." The world of King Lear is in many respects very different from the world of Henry V, and both diverge sharply from Comedy of Errors and The Tempest. The same can be said of the works of most great writers. There is far more between heaven and hell that can be limned in any mere philosophical system: and great literature, by being multi-faceted and portraying the whole range of existence (rather than just selecting a tiny swathe of it) seeks to illustrate this great truth. Given discussion of Atlas Shrugged's actual sales in comments, and the fact that the usual fake talking points about the so-called Library of Congress "study" are being circulated in conjunction with the movie, it's probably timely to re-run this. That assertion is of course nonsense, but it's surprising how many credulous naifs believe in the urban folk tale about the Library of Congress having undertaken such a survey or study proving Ayn Rand the #2 author in the universe. It has been repeated on UseNet & the World Wide Web thousands of times, without anyone being able to cite the specific study, because there was none, but by weight of repeating a legend, increasing numbers of naifs begin to assume it must be true..."
The most - in fact, the only - open-minded Randian academic periodical now has its archives fully accessible. As a sample, Eric Mack runs a ruler over Rand's ethics. While on Friday the Atlas Shrugged movie expanded from 299 to 425 theatres, helping to boost its overall gross a little, its crucial per-cinema returns fell by more than 70% - the most pronounced second Friday drop I could see in my quick skim of the Boxofficemojo charts. This is not a good sign for producers, and another indicator that the movie is simply running out of base. Quick, send round another mass email! Regular ARCHNblog commenter Laj Ogunshola delivers his verdict on the new Atlas Shrugged movie. Atlas Shrugged Pt. 1 is, first and foremost, a movie made for fans of the novel. I tried to imagine how I would put together a coherent narrative of the events I saw on the movie-screen without some familiarity with the source material and I could not for the life of me. Apart from dates and times, which often appeared after this or that major event, usually the disappearance of some executive, there is little help putting together the movie’s events from the screen itself. Character development is a foregone luxury in this movie, which is problematic in part because much of the core of Rand’s novel is introspective and deals with philosophical ideas. Box Office Mojo tells it like it is. He must get really, really tired of that one. The daughter - poignantly named Alyssa - of an Ayn Rand devotee tells her story of her father's real life application of Rand's ethical system.